While Hallmark’s Star Wars and Star Trek ornaments are well known holiday merchandise, we cannot forget the other related Hallmark genre ornaments. No, not the Harry Potter stuff, though those ornaments are great, but the ornaments based on popular science fiction films and TV shows. Although they’re not as numerous as Star Trek and Star Wars ornaments, they’re just as well-crafted. 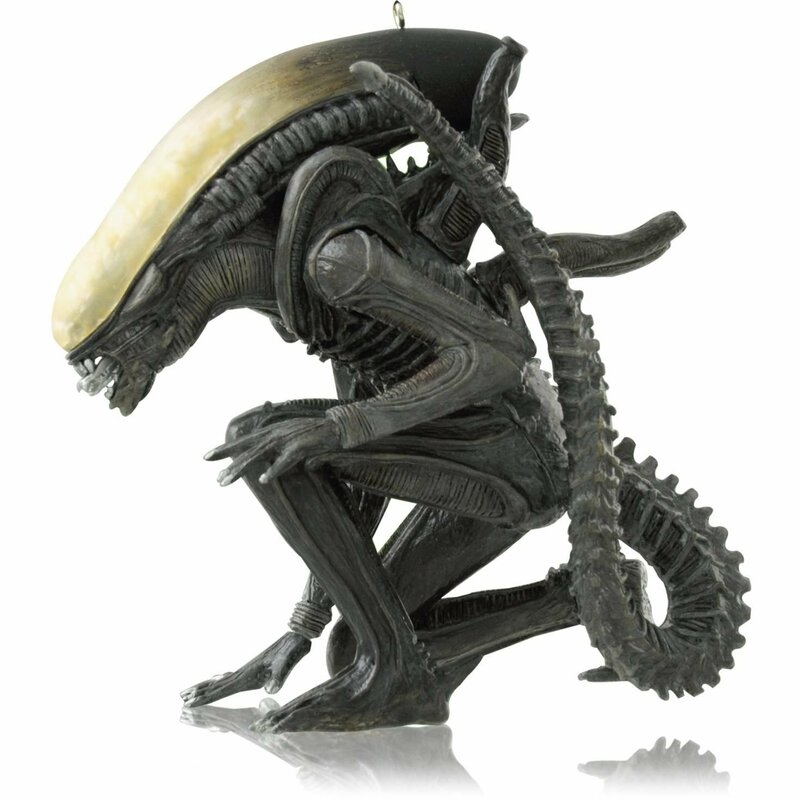 It’s too bad more aren’t produced because these sci-fi Hallmark ornaments are great gifts and additions to any fan’s Christmas tree. These are the best ones created to date, hopefully more will come in the future. 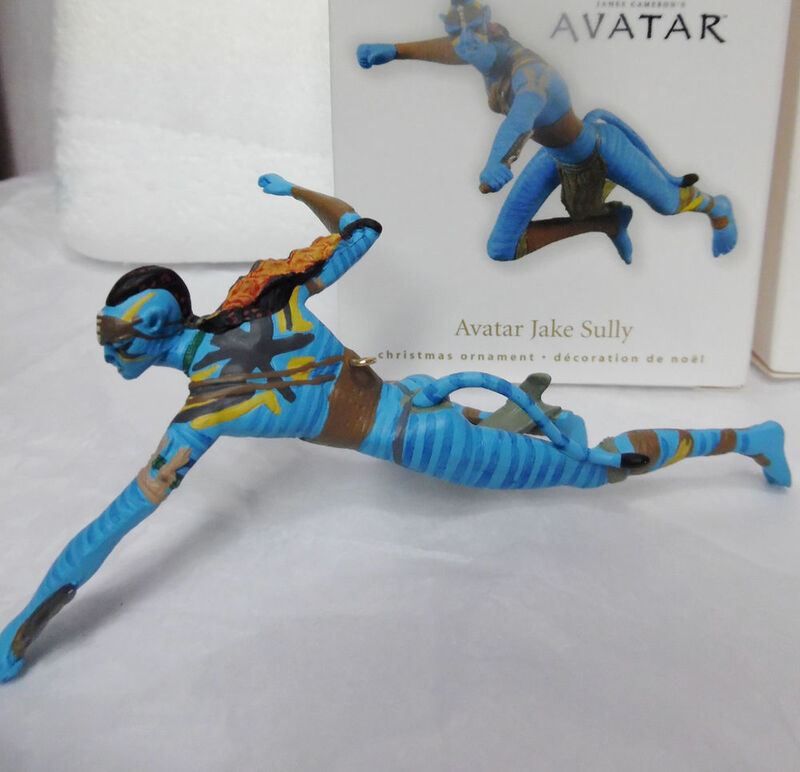 Fans can easily imagine that the tatted-up warrior hero from Avatar is protecting a giant mother tree with this dynamically posed ornament. 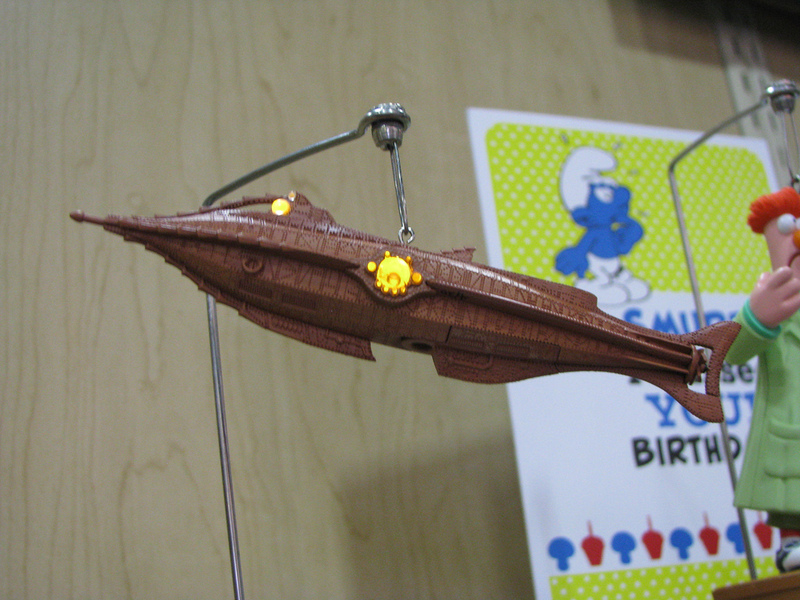 The miniature version of Captain Nemo’s steampunk sub is a faithful recreation of the Disney’s 1950s adaptation. 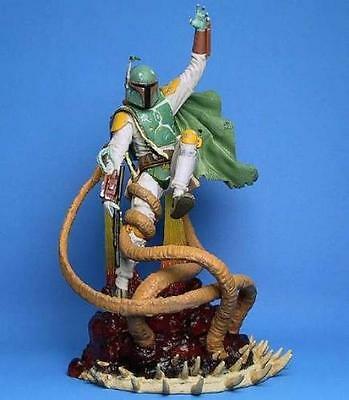 This was one of those limited-edition Hallmark ornaments that is hard to find, even when it was released. It would make a fine gift for any fan of the underrated gem of a film. One would think this kind of ornament would never work. Seriously, this alien creature is the stuff of nightmares. But it works thanks to its meticulous detailing and organic exo-skeletal look that somehow fits within a tree. This year marks a very significant anniversary for sci-fi films. Of course, it is the 50th anniversary of 2001: A Space Odyssey, but that is not the only sci-fi classic celebrating its 50th anniversary. That other film is Planet of the Apes, a sci-fi masterpiece which launched a successful film franchise that resonates to this day. 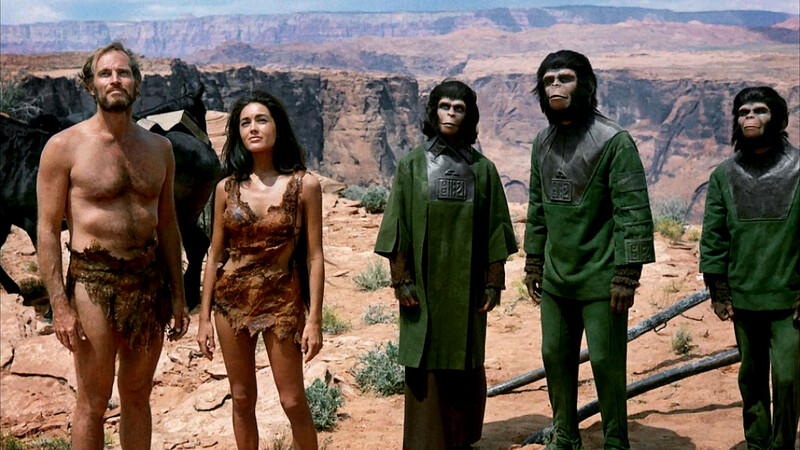 Planet of the Apes was a 1968 film adaptation of Pierre Boullle’s novel, which was published in 1963. The film, like the novel, was an allegorical examination of human society and how inhumane people can be. In the story’s case, the humans were represented by super intelligent apes that control the planet. George Taylor (Charlton Heston in one of his greatest performances) is an astronaut on a deep-space mission to find a new habitable world. He and his fellow astronauts crash land on an Earth-like planet centuries from now. Before long, Taylor is the only survivor and is captured by upright, talking ape-like beings that rule a pre-industrial civilization. During his capture, Taylor is injured and unable to talk, much less communicate. Most of the apes that hold him captive for science experiments treat him inhumanely and lump him along with the other mute and animalistic humans that inhabit the world. Taylor stands out because of his expressed intelligence and catches the attention of a simian scientist studying him, Dr. Zira (Kim Hunter). As Taylor regains his speech (done so dramatically when he shouts defiantly “Take your stinking paws off me, you damn, dirty ape!”), he befriends Zira and her husband, Cornelius (Roddy McDowell), an archaeologist. These two champion his cause for equal rights against the ruling apes that refuse to recognize Taylor’s intelligence. One of these members is the fundamentalist Dr. Zaius (Maurice Evans), who won’t acknowledge Taylor’s sentience, and seems to be hiding secrets about his planet’s dark past. Taylor’s struggle is the heart of Planet of the Apes and echoed the civil rights movement that engulfed American society in 1968. What is remarkable about Taylor’s plight is that at the start of the film he had a dim, pessimistic view of humanity. So it’s a great sense of irony when he alone is forced to champion humanity to the dogmatic apes that refuse to acknowledge his rights, let alone his intelligence. This was best seen in the pivotal tribunal scene where Taylor pleads his case to the obtuse Assembly led by Zaius. They try to deny his humanity and dignity, but he rose to the occasion and we cheered him on. 10. Admiral Ackbar (2015): One of the best limited edition Star Wars Hallmark ornaments was devoted to the amphibian Rebel leader. The sculpt was a perfect reproduction of Admiral Ackbar. 9. 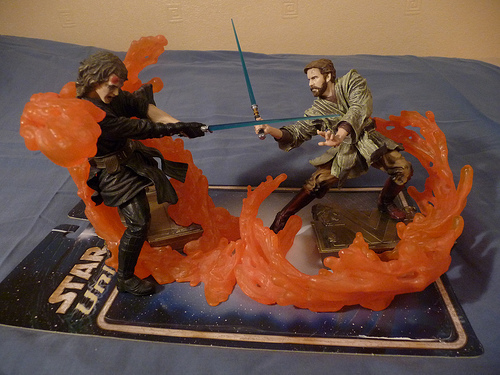 A Deadly Duel (2009): Despite the disrespect the prequels get, one thing everyone enjoyed was the climatic duel where Qui-Gon Jinn and Obi-Wan Kenobi battled Darth Maul. This ornament perfectly captured that thrilling moment in Star Wars Episode I: The Phantom Menace. 8. 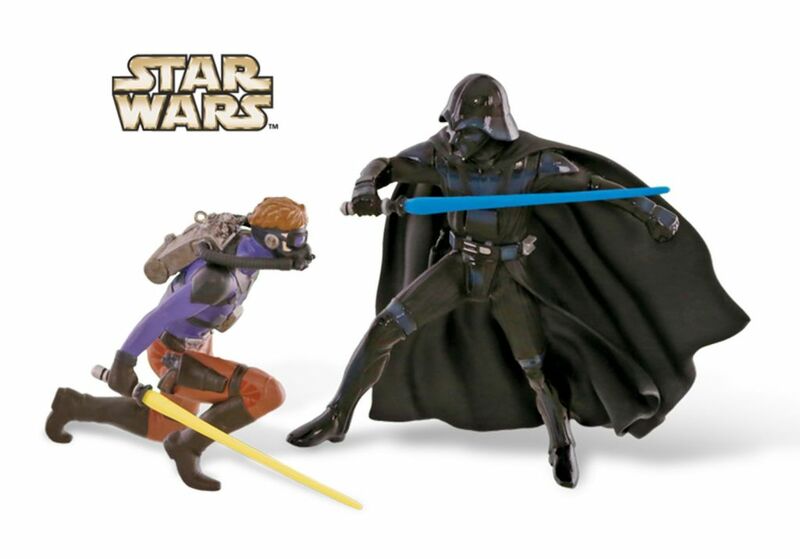 Luke Skywalker and Yoda (2006): This dual character ornament is the ideal blending of two characters since it represented Luke’s Jedi training on Dagobah and Yoda’s iconic teachable moments. 7. Chewbacca (1999): Everyone’s favorite Wookiee was one of the best solo character ornaments and fits perfectly on a Christmas tree. After all, Chewbacca’s from an arboreal world. 6. Han Solo to the Rescue (2012): This Star Wars Hallmark ornament of Han Solo in his cold weather gear atop a tauntaun just looks perfect hanging from a Christmas tree or even on your desk. 5. An Epic Vision, a Star Wars Celebration (2015): The best limited edition Star Wars Hallmark ornament is also one of the rarest and a true treasure. The sculpts eerily recreate Ralph McQuarrie’s famous pre-production art for the first Star Wars film. 4. 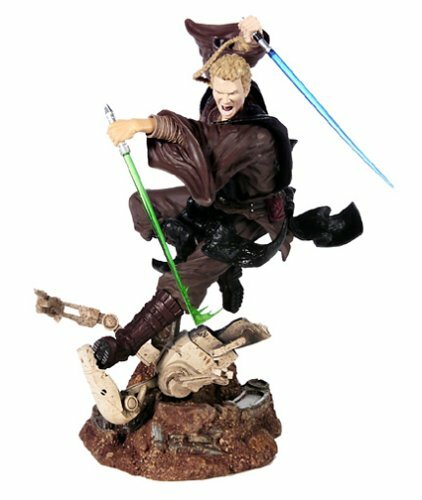 Anakin Skywalker and Obi-Wan Kenobi (2005): Colorful and striking with flaring lava plumes, this ornament is a superb recreation of the epic final battle between the Jedi and his former apprentice. Features powerful dialogue and clashing lighsaber sounds. 3. 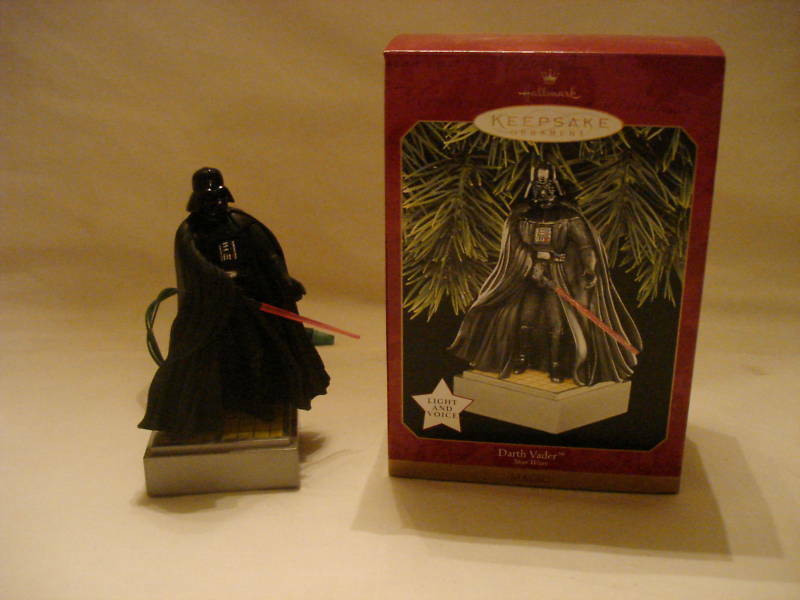 Darth Vader (1997): The first Darth Vader ornament is still the best one. Lord Vader stands imposingly on a lit base with his glowing red lightsaber. 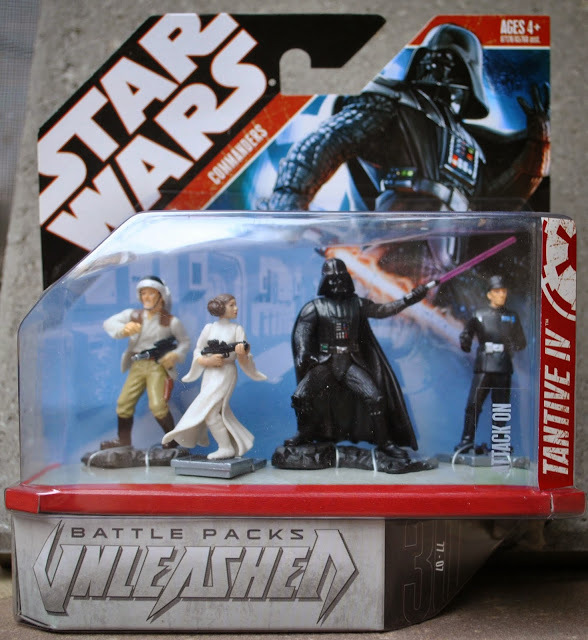 It doesn’t get any better though future ornaments like the Rise of Lord Vader (2014) and the Darth Vader Peekbuster came close. 2. 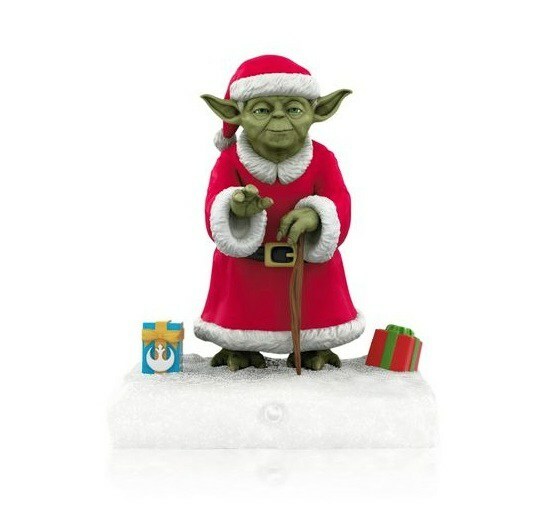 Yoda Peekbuster (2014): Hallmark first launched this motion sensor ornament in 2012 with a Darth Vader Peekbuster. The concept is simple, you walk by and the ornament would talk to you, warning you away from the presents. The Yoda Peekbuster is superior because the little green Jedi Master better captures the spirit of the holidays and can be thought of as an honorary elf. 1. The Adventure Begins (2007): This one is a bit of a cheat since it features a spaceship, the Millennium Falcon, but it’s a terrific diorama. It depicts the moment the Falcon departs from the Mos Eisley spaceport on Tatooine as it whisks off our Rebel heroes on a grand adventure that changes the galaxy. Not only does the Millennium Falcon’s engines light up, but John Williams’ legendary Star Wars theme blares from this ornament, which is a superb touch. 10. Darth Vader’s TIE Fighter (1999): This is a rather neat Star Wars ornament, with its best feature being the lit-up cockpit that reveals Darth Vader’s silhouette. 9. 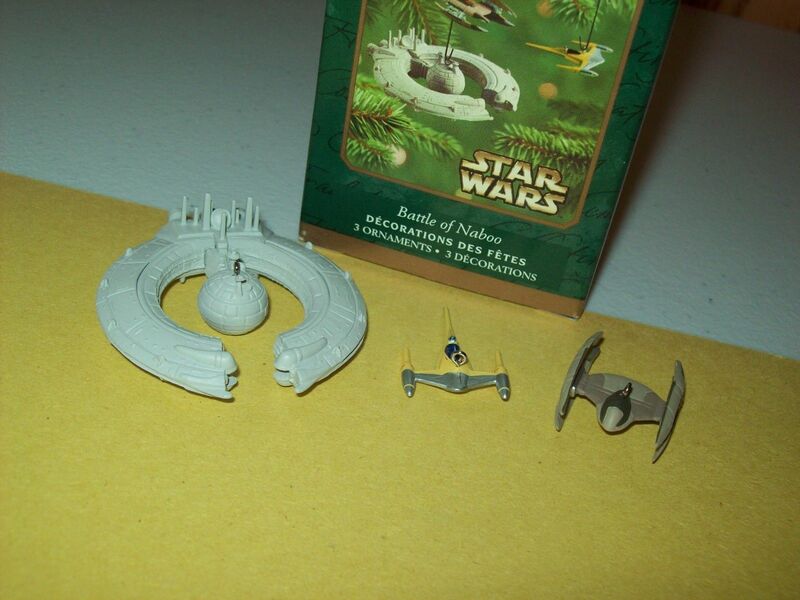 The Battle of Naboo (2001): This is the best miniature Star Wars ornament which features the Trade Federation’s starship flanked by tiny Naboo and vulture droid fighters. 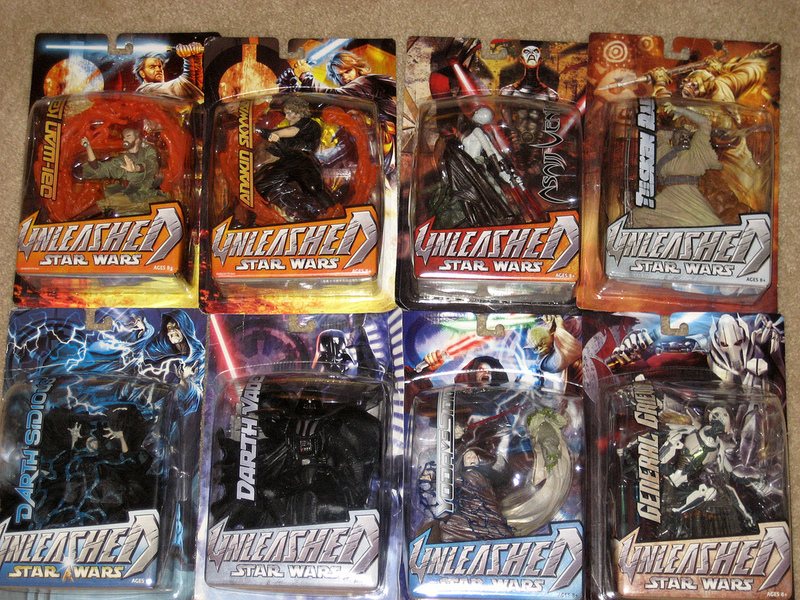 It was a novel concept for Hallmark and portended to greater Star Wars ornaments. 8. The Death Star (2017): Incredibly, it’s the first time we’ve gotten a full-size ornament of the original Death Star. And it is wildly impressive thanks to sounds and lights that accurately depict the infamous battle station. 7. Slave I (2011): Boba Fett’s weird vertical spaceship gets some love from Hallmark with this ornament. As always, Hallmark went the extra step to faithfully recreate the look and sounds of the bounty hunter spaceship. 6. 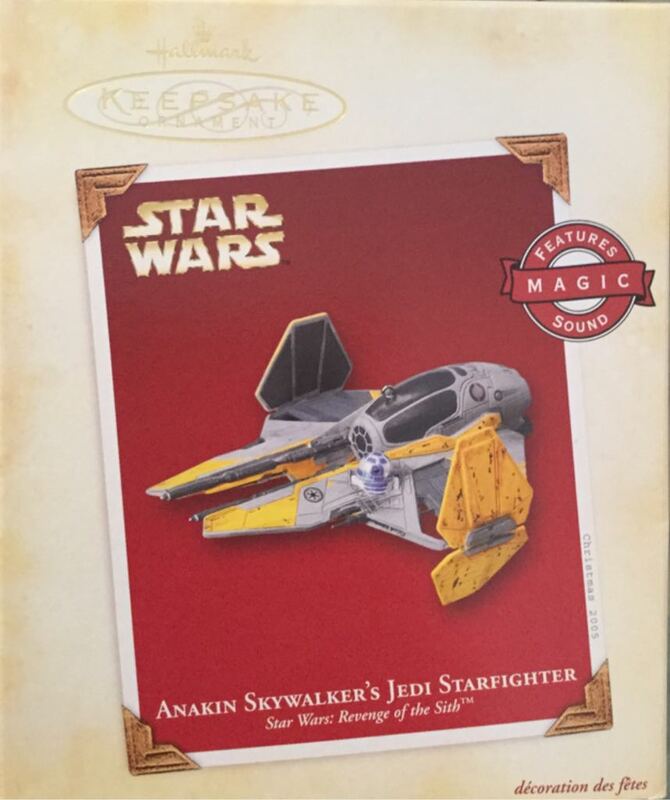 Anakin Skywalker’s Jedi Starfighter (2005): One of the best ships seen in the prequel films was well crafted by Hallmark. Striking due to its design and yellow coloring, the Jedi Starfighter is clearly one of the most underrated Star Wars Hallmark ornaments. 5. 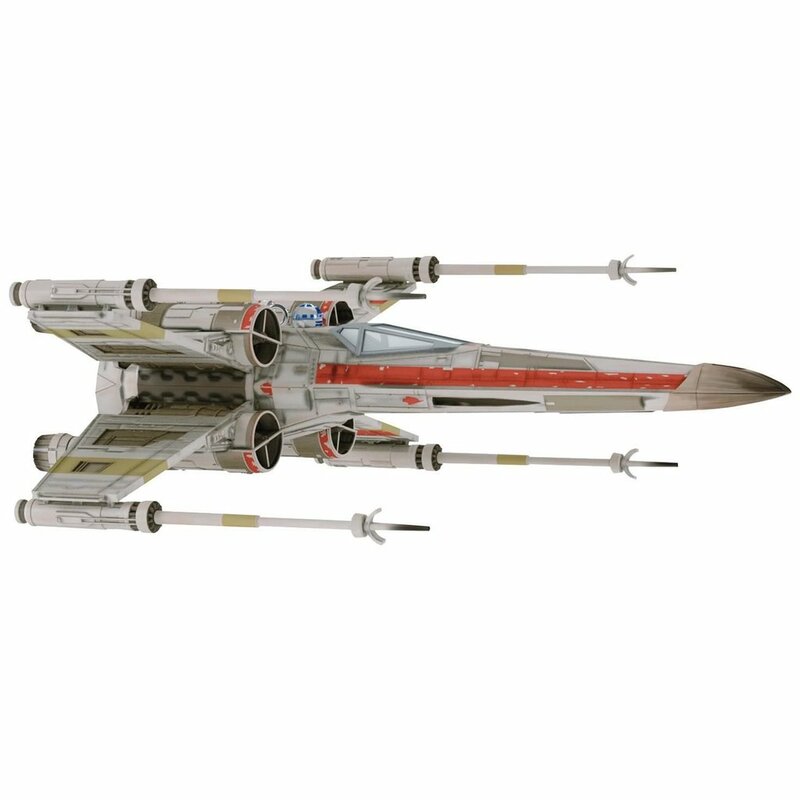 T-70 X-Wing Fighter (2016): Poe Dameron’s eye-catching X-Wing fighter with its distinctive black color sets this ornament apart from other X-Wing ornaments. If it lit up like the others it would have rated higher on this list. 4. 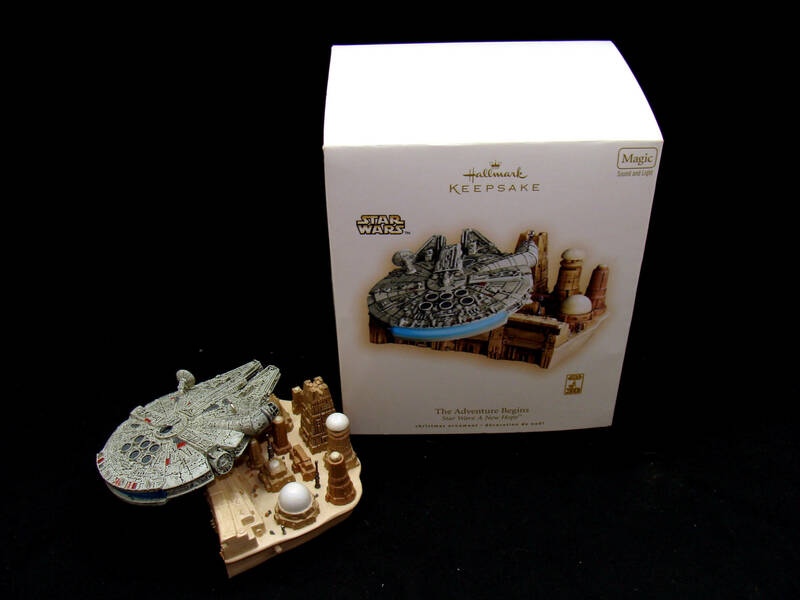 Star Destroyer (2004): The last Star Wars Hallmark ornament that plugged into a Christmas tree socket depicts the famous opening moment in Star Wars Episode IV: A New Hope as the imposing Star Destroyer captures the tiny Rebel blockade runner. 3. 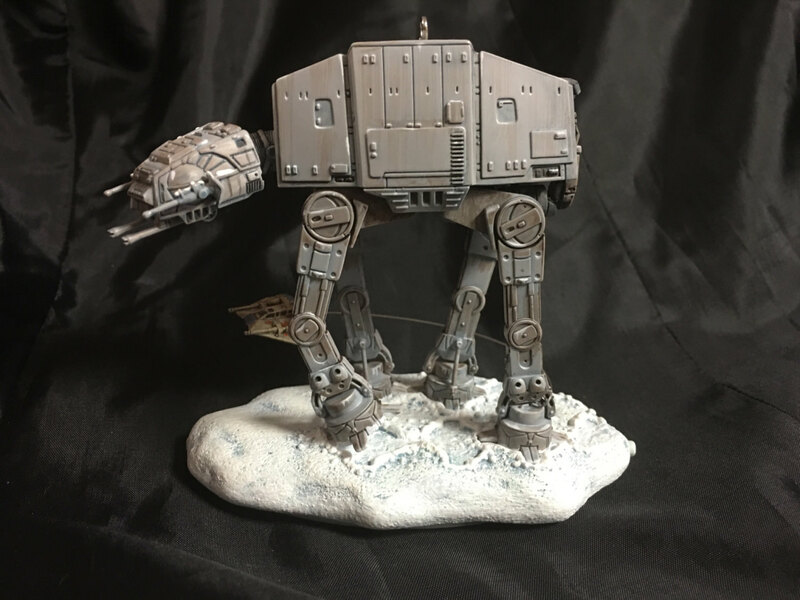 Imperial AT-AT and Rebel Snowspeeder (2006): It can be argued that this is more of a diorama but the walker is so prominent it belongs in this category. The walker stands on a snowy base as a tiny Rebel snowspeeder is buzzes around its metal legs. 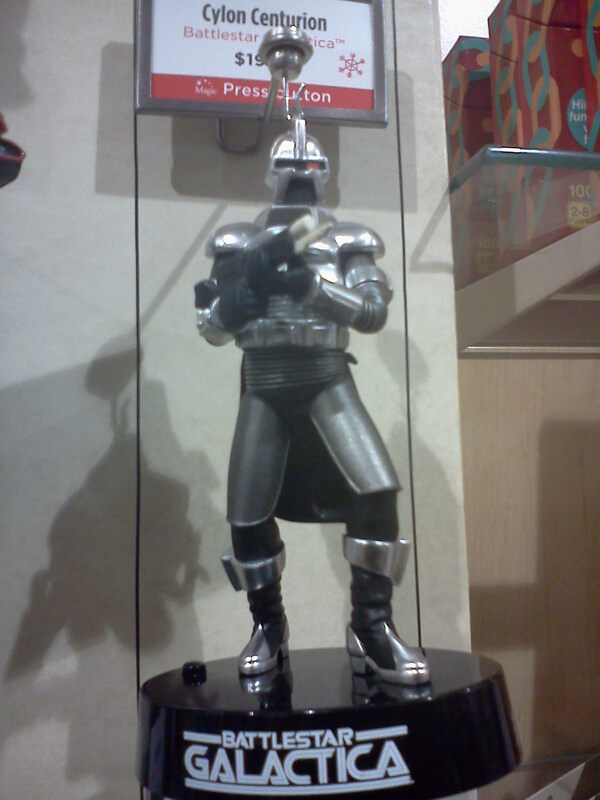 The battle sounds nicely complement this ornament. 2. X-Wing Starfighter (2017): This huge ornament improves upon the original X-Wing ornament that came out in 1998. Like the original it lights up but now has sounds and better detailing. 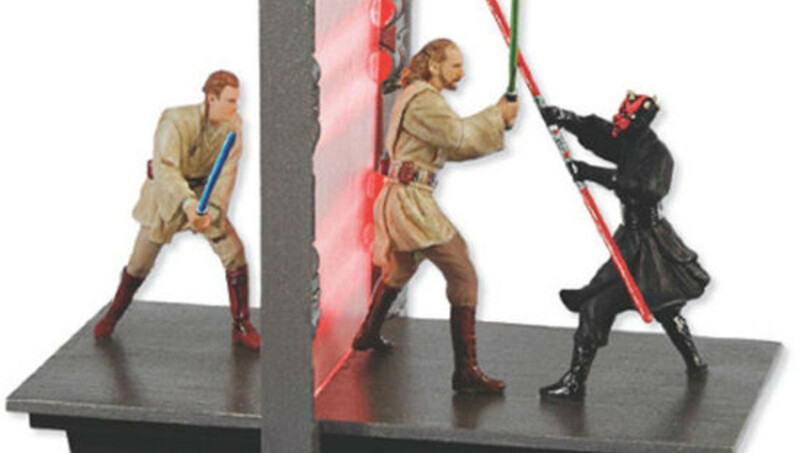 This pricey ornament is part of a set that includes Vader’s TIE fighter and the Death Star. When put together the three of them recreate moments from A New Hope with sounds.. 1. 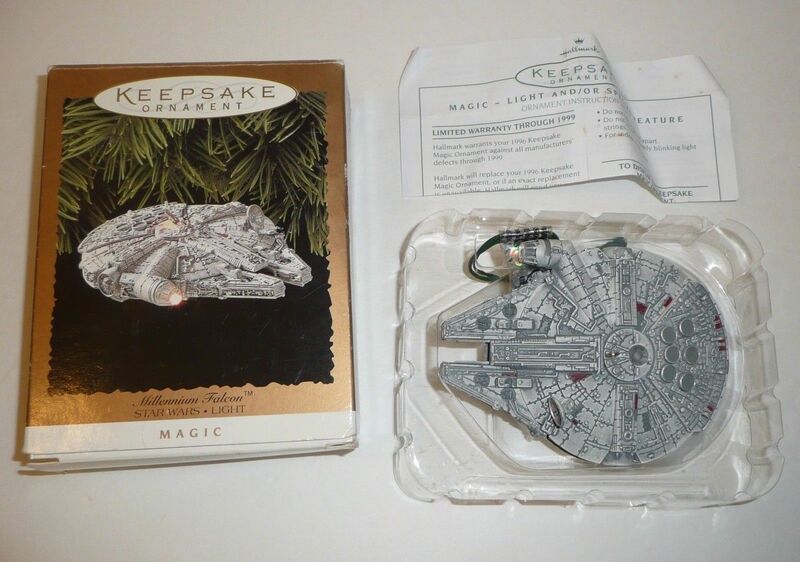 Millennium Falcon (1996): The best Star Wars ship ornament just happens to be the very first one released by Hallmark in 1996. It’s one of the older ornament models that plugs into a Christmas tree’s light socket, but just look at the detailing. The Millennium Falcon looks so real with its dark grey hull, engine and cockpit lighting; this beauty has weight and heft. Thankfully, next year Hallmark will produce a newer version of the ship that made the Kessel run in 12 parsecs. 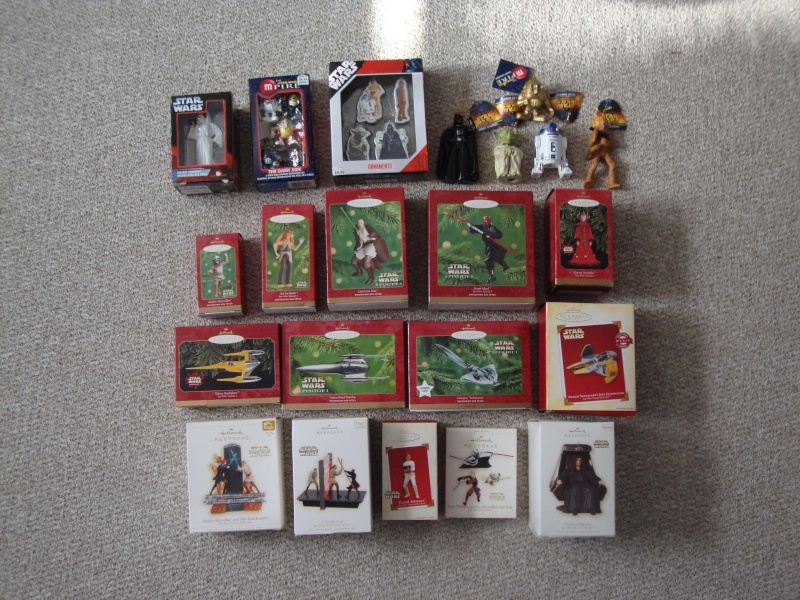 When it comes to ornaments, Star Wars may be the big thing given the abundance of Hallmark ornaments that are all over the stores now. 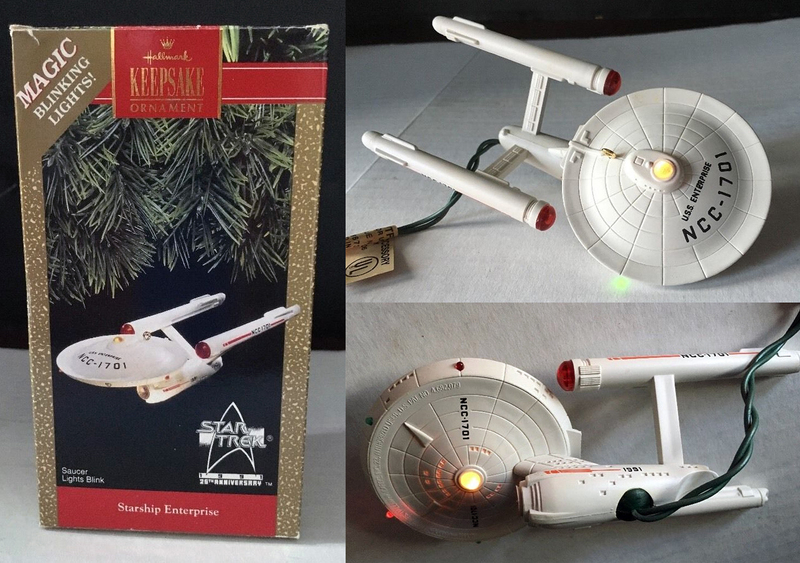 However, Star Trek fans know all too well that their beloved franchise started the Hallmark ornament craze back in 1991 with the release of the original Enterprise ornament. Over the years, Hallmark has made some truly beautiful Keepsake ornaments about Star Trek and that tradition continues. 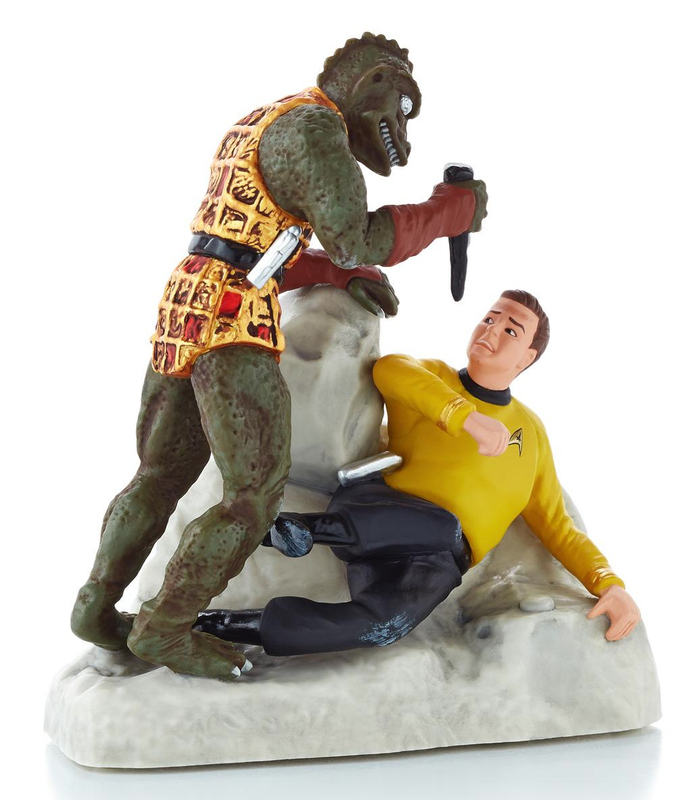 While the amount of ornaments available may pale when compared to Star Wars, there is solid demand for Star Trek Hallmark ornaments and it looks like it be with us for a long time. What makes these Star Trek ornaments so beloved are Hallmark’s attention to detail. Each ornament is a painstakingly accurate rendition of the ship or character. They can be displayed all year long on your desk or wherever, they don’t just belong on a Christmas tree, though they’re often the highlights of a decorated one. Fans also can look forward to the featured lights or sounds that many of the ornaments have. 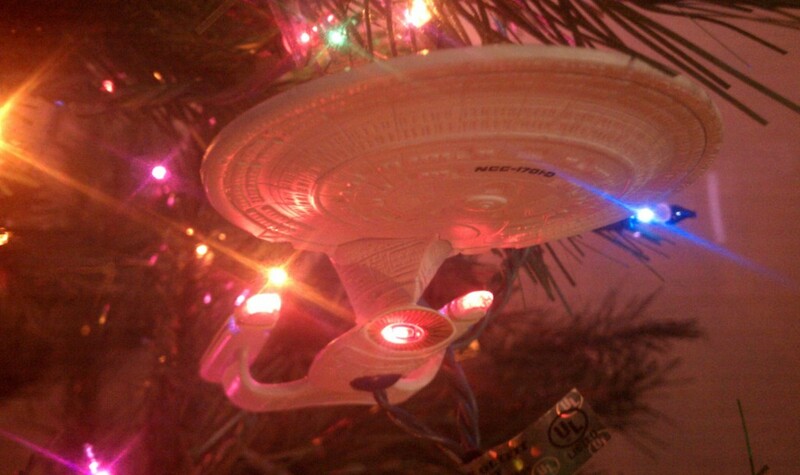 One advantage the Star Trek ship ornaments have over the Star Wars ship ornaments is that they light up. For some reason few of the Star Wars ship ornaments have this feature, they mostly just make noise or have dialogue. This light up feature has been with the ornaments from the very beginning and hopefully will remain with future ornaments. But one problem with the older ornaments (and this applies to the earlier Star Wars ship ornaments) is that they had to be screwed into the light socket of a Christmas tree light. There is a limit to how many ships you can do that with and it’s a real pain to yank out a light bulb, stick in the ornament plug then replace the bulb at the end of the Holiday season. Also the lights have changed over the years necessitating having to use adapters. The newer ornaments instead come with batteries but now the ships won’t stay lit continuously. 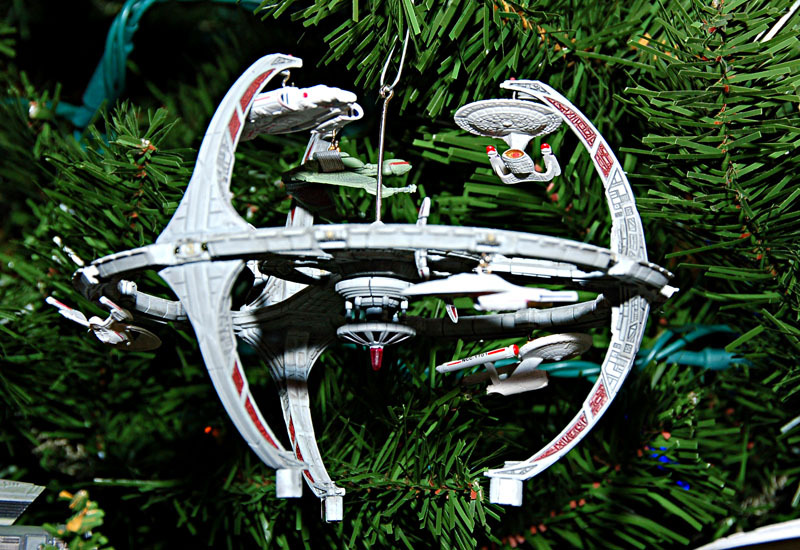 But it’s a good solution and Hallmark should give serious thought to re-issuing the older ornaments like the Romulan warbird or the Enterprise-E with this feature. As long as there are the fans and the creators at Hallmark can come up with new ideas each year, the Star Trek ornaments will be a mainstay in any fan’s Holiday wish list. And yes, they make wonderful gifts for Star Trek fans. 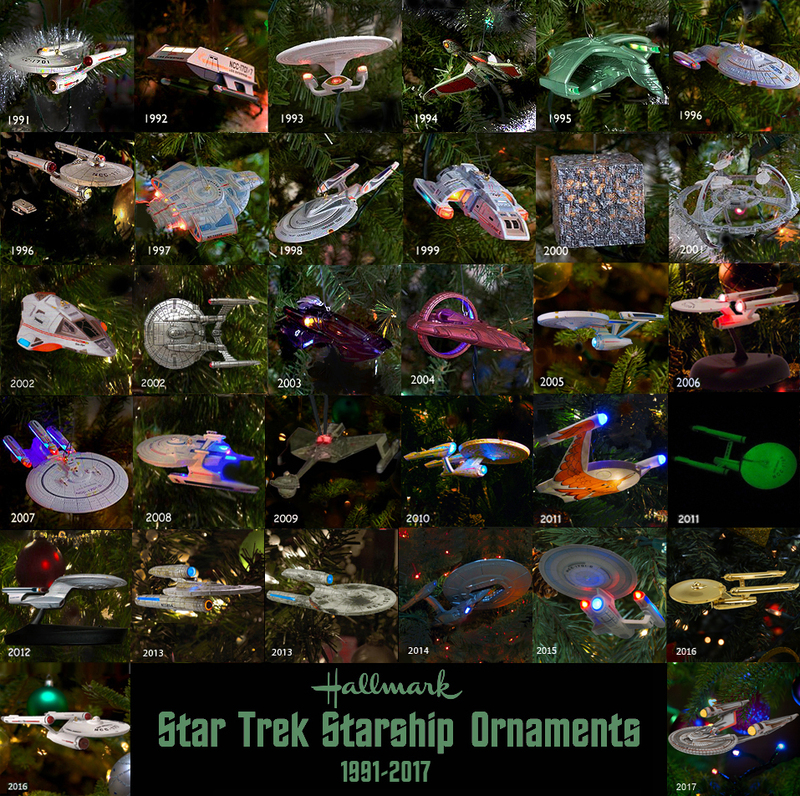 Listed below are the ten best Star Trek ship ornaments and the ten best character/diorama ornaments. TIE: 10. Arena (2013)/Amok Time (2010): Both ornaments feature Star Trek’s memorable battle music, perfect for the Holidays. 9. Lt. Commander Worf (1999): The mighty Klingon is ready to fight in this striking pos and it’s one of the best sculpted character ornaments. 8. Star Trek Legends #1 Captain James T. Kirk (2010): What list would be complete without a solo ornament of Star Trek’s greatest captain? 7. To Boldly Go (2016): Good luck finding this one! Perfect diorama of Kirk, Spock and McCoy to celebrate Star Trek’s 50th anniversary. 6. The Needs of the Many (2015): From the final moments of Star Trek II: The Wrath of Khan, Spock’s farewell to Kirk evoked the sad passing of Leonard Nimoy. 5. Star Trek II: The Wrath of Khan (2007): This diorama ornament lets you relive the confrontation via viewscreen between the Enterprise and the Reliant. 4. Locutus of Borg (2005): What makes this ornament stand out are the bright lights of Locutus’ station, which goes well in a Christmas tree. 3. Transporter Chamber (2006): No one can stop pressing the button on this ornament to hear the sights and sounds of the transporter in action. 2. 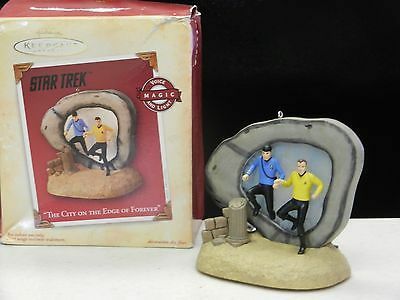 City on the Edge of Forever (2004): The first Star Trek diorama ornament is still one of the best looking ones as Kirk and Spock dive through the Guardian of Forever. 1. The Trouble with the Tribbles (2008): True story; yours truly inspired this ornament. 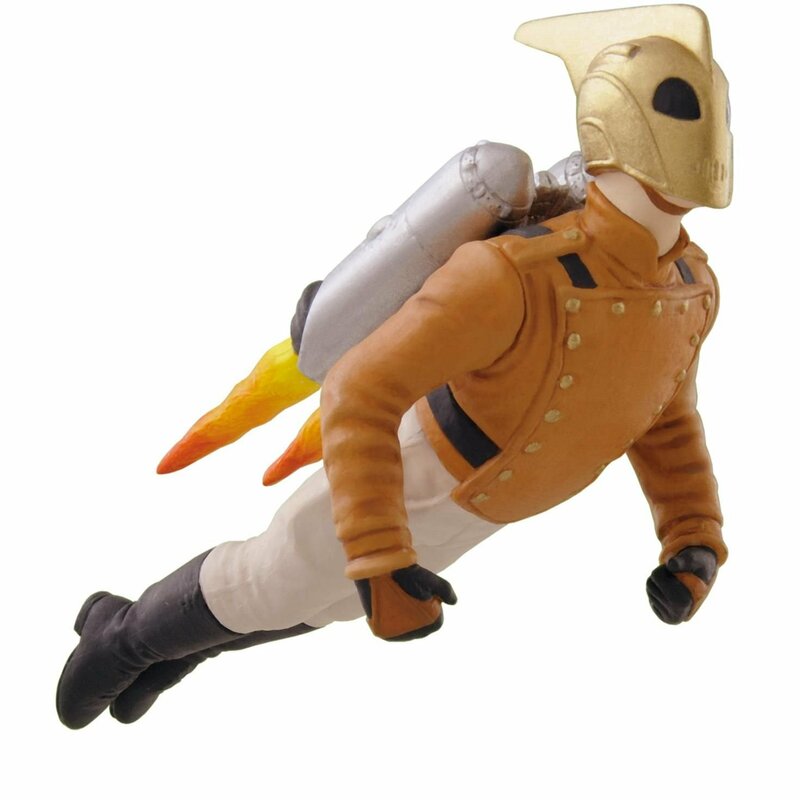 Years ago I used to leave comments on the forum Trekbbs.com. 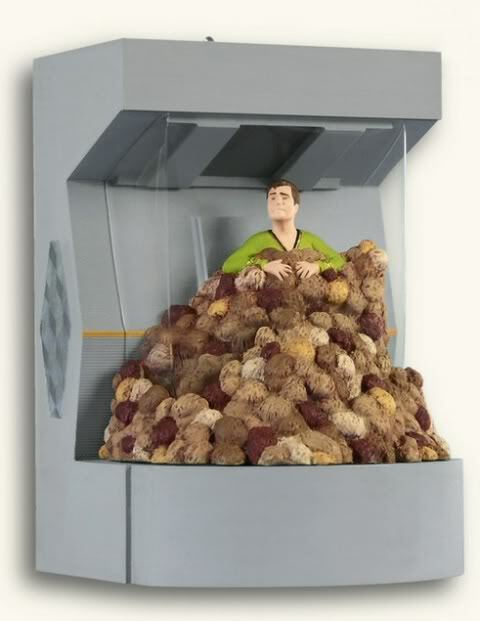 Some of the threads were about a wish list for ornaments and I left a reply that Hallmark should recreate the iconic funny moment in “The Trouble With The Tribbles” where Kirk is flooded with hundreds of tribbles. Lo and behold, a couple of years later this ornament comes out and on another thread on the site about ornaments, I commented that someone at Hallmark must be reading the forum. To my surprise someone replied to my comment stating that he or she was a sculptor at Hallmark and usually perused the forum for ornament ideas. You’re welcome. I’ll take one of those rare convention ornaments as a reward, please. 10. U.S.S. Enterprise “pilot version” (2016): Another re-issue of the Enterprise is highlighted by its shiny gold covering to commemorate Star Trek’s 50th anniversary. TIE 9. U.S.S. Enterprise-C (2015)/Klingon Battle Cruiser (2009): This Enterprise is the most underrated ship ornament, while the Klingon ship looks quite imposing hanging from a tree branch. 8. 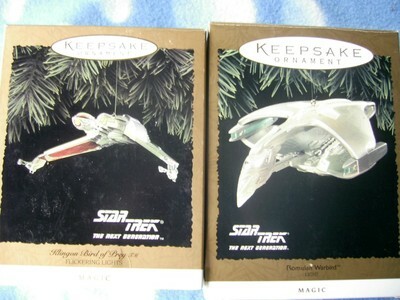 Romulan Warbird (1995): Its large size and greenish tones/lights make this one of the best looking Star Trek ornaments. 7. Klingon Bird of Prey (1994): This ornament surprisingly blends in well in Christmas trees thanks to its colorful detailing and lights. TIE 6. U.S.S. Enterprise (2006)/ Delta Flyer (2002): For those who couldn’t get the original Enterprise, and the Delta Flyer is the best of the obscure ship ornaments. 5. Deep Space Nine (2001): This larger than normal ornament allows you to hook on mini-ornaments of Star Trek ships to its pylons. 4. U.S.S. Enterprise-D (1992): Don’t bother with the 2012 unlit version, get this one instead, it looks awesome lit up. 3. U.S.S. Defiant (1997): A personal favorite recreation of one of the best looking and hardiest Star Trek ships. 2. U.S.S. Enterprise-A (2005): The first ornament to require batteries to operate and a lovingly detailed replica of the best movie ship. 1. U.S.S. 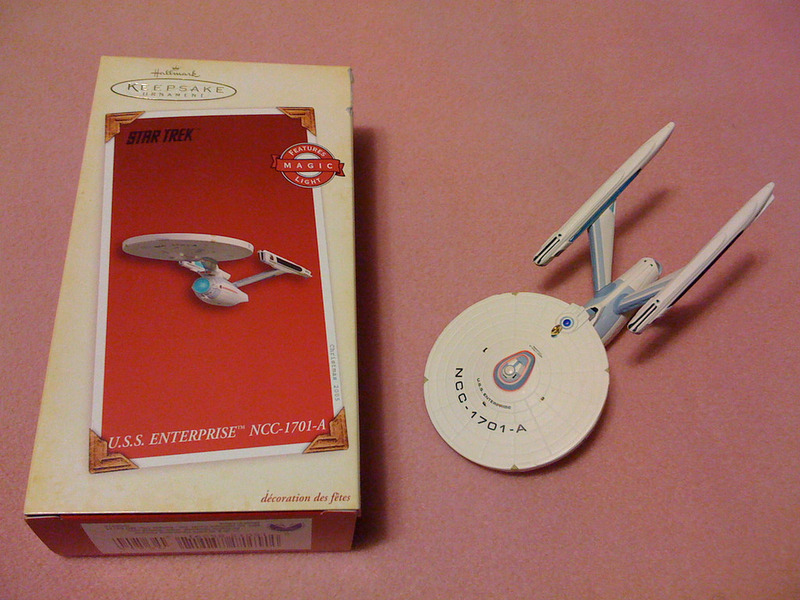 Enterprise (1991): The one that started it all is still the best and most prized Star Trek ornament. Trying to find one at a reasonable price online or in a convention is a feat unto itself but it’s worth it because it’s the Holy Grail of Star Trek ornaments. The other ornaments that followed may be more detailed and more refined than this Enterprise ornament but this one holds a special charm in its elegance and function. A definite must-have for any collector.